You already know remodeling your home is one the most effective ways to increase equity and resale value, but what about that dreaded number game we all have to play at the end of the year? Can you write-off renovation expenses on your income taxes? And if so, what kind of deductions can you reasonably expect to receive? Can I write-off my home improvement expenses? Although the immediate answer is one you likely don’t want to hear, improvements made on a property that is considered your primary place of residence cannot be used as an end-of-year tax write-off. This encompasses virtually every type of renovation, from room additions to deck installations to landscaping work to a new roof. In these situations, the government classifies home improvement labor and material costs as “nondeductible personal expenses.” Despite this, however, the possibility still exists for you to save a good amount on your annual tax bill. If you are intending on selling your home in the near future, be sure to keep a record of all the receipts you acquired during the renovation. In the event that you secure a profit from the sale of the property, which is bound to occur since most home improvement projects offer a healthy return on investment, you will then see a reduction in your tax liability. The term to be aware of here is “basis,” and this refers to the sum total of all your home investments from a tax perspective. Every expense is taken into account; given that your profit margin drops with every dollar you invest into the home, the Government will provide a tax break reflective of the ratio. In most instances, save for a few special circumstances, you are required to live in the residence between 3-5 years to qualify for a basis tax reduction. Taxable gain is defined as the final sales price of a property less the adjusted basis; capital losses occur when the resulting number is negative. On the other end of the spectrum lie investment properties, and under these circumstances the tax deduction process is a bit more convoluted. Not considered a primary residence, improvements made to these houses are viewed as business expenses. General repairs and routine maintenance do not qualify as tax write-offs, as they are differentiated from renovations and other extraordinary improvements. The latter is anything that improves upon the property’s normal function, rather than restores it to its regular state (IE maintenance). 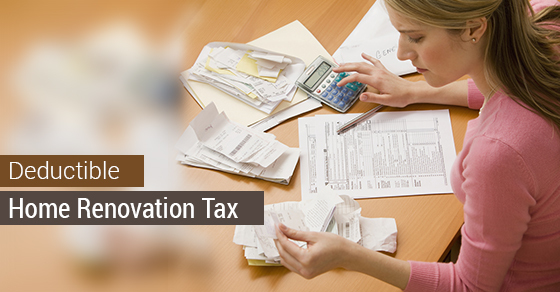 Contact your bookkeeper if you are unsure whether your renovation is tax-deductible.